From Friday to Sunday next the European Indoor Championships are in Glasgow and just one athlete from Waterford is on the Irish team competing and that is Thomas Barr in the 400 metres. Twenty six athletes have entered for the 400 metres and on this season’s best times for each athlete Thomas is well down the list with his 47.05, his best ever time is 46.87 the fastest time this year is 45.55. Someone very familiar to Thomas is entered Warholm from Norway World 400 metres hurdles champion and who won the 400 metres Hurdles European Championships last year with Thomas third-he is the one who ran that 45.55 this year on the flat – and also there is Tony Von Diepen Netherlands who just pipped Thomas in Athlone recently in the special indoor 400 metres hurdles. Thomas will be into action on Friday morning in the 400 m heats at 10.20 am in Glasgow and if progressing the semi final is later that evening at 8.55 pm and the final is on Saturday at 8.22 pm. The 400 metres indoors is usually a scramble for places after the first lap of the two as the runners break lanes with elbows flying as we saw in the recent National Championships putting paid to Thomas’s chances We wish him well and hope he will have a satisfying experience in Glasgow. On Sunday next in Dundrum Co Tipperary the Munster Road Championships over 4 miles for men and women take place starting with the women’s race at 1pm, categories are Senior,Novice and Master’s. On Tuesday March 5th at 11am the Munster Schools Indoor Games are in Nenagh. Coming up on Saturday March 9 th at 10 am in Dunhill is the Annual Dunhill/Fenor 10 miles Run in aid of Crumlin’s Children’s Hospital, please note this is for runners only (no walkers) and under 18 runners are not eligible to compete in it. Nenagh was the venue on Saturday and Sunday last for the Munster u12 to 19 indoor championships and Waterford athletes were in fine form winning several titles and also securing silver and bronze medals. 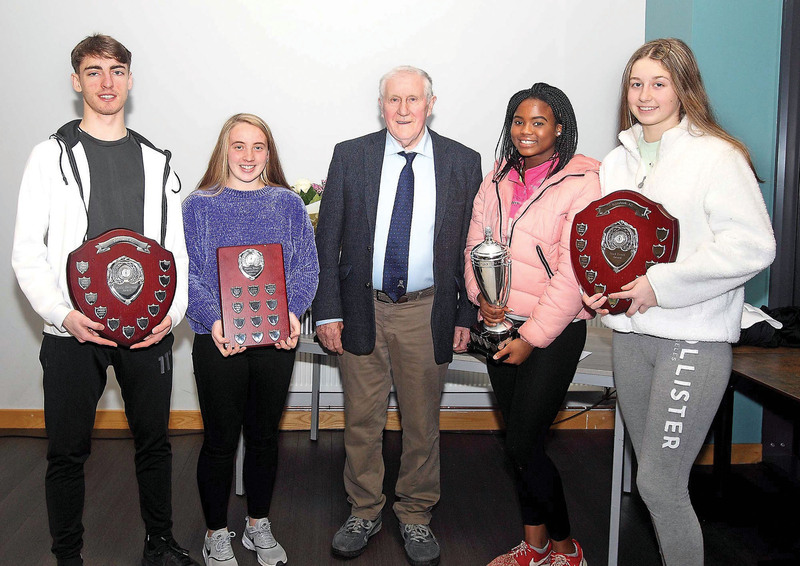 For Waterford AC it was a very successful week end with wins by Emily O’Mahoney in the u19 60 m hurdles and triple jump, Aidan Burke in the 1500 metres u17, Meabh O’Connor u16 walk and Daniel Farrell also u16 walk,second placings went to Anna Duffin 400 metres u18, Emily O’Mahoney long jump u 19, third placers were Aidan Burke u 16 800m, Anna Fanning again in the under 16,800 m, Emer Mc Glynn in the u18 800m Hubert Homa u17 1500 metres ,Evan Marshall u18 1500 m. Emily O’Mahony u 19 60 m, Emma Caulfield u19 1500 m. for Ferrybank Jake Bagge won the u19 1500 m and Callum Hurley was first in the u17 800 m, second placings went to Isobelle Cummins u19 1500 m, Paula Igwe u17 long jump, Petra Igwe u13 high jump and both girls were also third in their sprint hurdles. Lucy Holmes West Waterford won the u18 800m and Doireann Hickey was third in the u 14 walk ,for Finnisk Valley Corey Scanlon was second in the u 14 shot putt and Ava Flavin was 2nd in the u 12 60 m and Dara O’Neill Tramore was third in the 200 metres u 16.